Your incoming SMS messages are received in to inboxes. There are many ways you can configure your inboxes to automate receiving and responding to messages. This saves time and makes it easier to acknowledge, and respond to messages from a single place even when you’re not online or available. You can set up an auto response to automatically reply to any incoming message. You’re also able to forward any message to another mobile number or email address. The inbox can be configured to automatically add any brand-new senders to a new, or existing group list. That means that’s less time spent on admin tasks and more time spent on replying to your customer’s questions and queries. The SMS inbox comes into its own when you have multiple responding and forwarding options live at the same time. To quickly jump to a section of interest, please click one of the below topics. To access your SMS inbox settings, select the relevant inbox and click Settings. This page is split into two sections, on the left-hand side, you have your Response Functions. Items here allow you to schedule messages or instantly respond to messages. On the right-hand side, you have your Forwarding Functions. Functions here allow you to automatically send inbound messages to a mobile number, a contact group, email address or URL. To set up an immediate auto response, navigate to Response Functions. Select Send an autoresponse to each incoming message and select the Sender Name and type your message in the Message section. You can include all types of Textlocal attachments in your auto response such as PDFs, links, surveys and forms. Offering a voucher with a discounted code in your SMS auto response? No worries, you can select Don’t send autoresponse repeatedly to make sure you only send the discount code once to each contact. Once you’re finished, click Save Settings and your text message inbox will be updated. The auto response will be triggered each time your inbox receives a new SMS. You can also set up a series of scheduled auto responses if you want your outbound communications to arrive at different times. To do this, navigate to Send scheduled auto responses and tick this, then select New Scheduled Autoresponder. 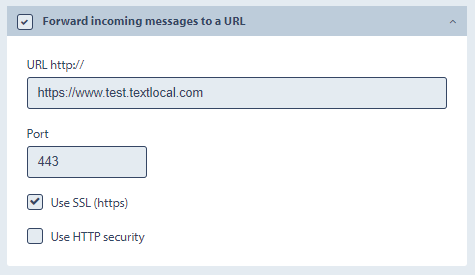 Again, you can include all types of Textlocal attachments to your scheduled autoresponder. You can create multiple auto responses for each inbound message. You have the option to set your outbound communications to send after 1 minute, or up to 12 weeks after the original message was received. If you select anything after 1 day, you’re able to specify a send time too. With the What if this person texts in again? field, you can either keep or delete the schedule of auto responses that were associated with the original inbound message. Once you have configured your autoresponder, click Save Autoresponder. Scheduled auto-responses will consume credits as normal. Have a campaign where you want to capture email addresses? You can configure your SMS inbox settings to extract an email address from an inbound message. For example, your promotion may ask customers to text in to receive a formal invitation to an event. 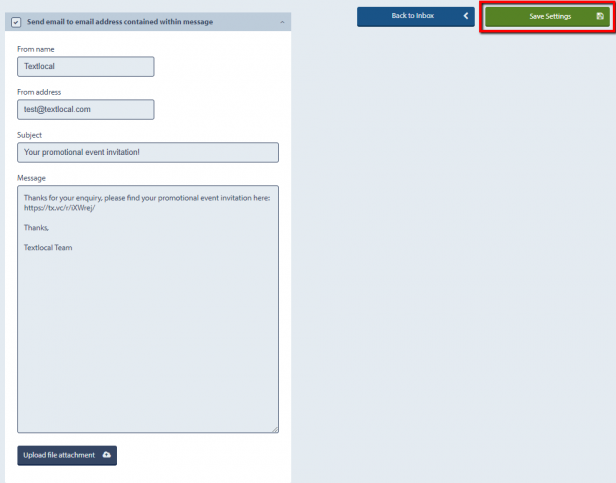 Your customers could enter by texting “EVENT” to a short code, followed by their email address. Textlocal will then automatically send an email, including the event invitation, to this address. You can configure the sender name, subject line and content, and there is no additional cost to sending this email. To configure this setting, navigate to Response Functions and select Send an email to email address contained within the message. Once these settings have been configured, click Save Settings on the right-hand side. From name: the name that will be displayed in the customer’s email client (your name or business name). From address: will be the email address you would like to send from. Subject: is the subject line of the email. Message: will consist of the plain text message you would like to send. Upload File Attachment: will be the file you would like to attach such as an image, PDF or ZIP file. *Word documents and Excel spreadsheets are not allowed to be attached for security reasons. If you want to remove an attachment, unselect the attachment and click Save Settings on the right-hand side. The attachment will then disappear, and you will have the ability to add a new attachment as needed. Want to automatically add any inbound sender’s number to a pre-existing or brand-new contact group? You can do so by navigating to the right hand of your inbox settings to the Forwarding Functions section. Go to the first box which says Add sender to a group list. You can select an existing contact group, or create a brand-new group from here by selecting Add Group on the drop down. You can also add the content of the inbound SMS to a custom field. Once you’re finished, click Save Settings. To forward any new inbound message to an email address, go to the second box where it says Forward incoming messages to an email address. You can add up to 20 separate email addresses here. Once you’ve entered one email address, hit enter to break to a new line and start typing the second email address. You can include previous conversations in the email thread as well as have the option to disable forwarding message to the email sender. An advanced email template is available for adding more detail to the forwarded emails. Click Advanced Email Template to view this. Once done, click Save Settings. The email addresses you enter will be notified when a new inbound message arrives in your SMS inbox. Inbound messages can be forwarded to your website or server. This feature is useful if you wish to send your messages to a monitor or a feed. To do this, navigate to Forwarding Functions on the right-hand side of the page. Go to Forward incoming messages to a URL and enter the URL, and Port you wish to receive messages on. You can choose whether to use HTTP security by toggling the option. This allows you to enter a username and password on the domain. Once done, click Save Settings. Messenger also allows you to forward an inbound SMS message to a separate mobile number. You may want to be informed when you’re on the go if there are any new inbound messages. To forward a message to a mobile phone, navigate to the fourth section called Forward incoming messages to a mobile phone under Forwarding Functions. You can access an advanced template for you to add custom fields to a message by clicking Advanced Forward Template. Once you’ve entered a mobile number click Save Settings. Forwarding to a mobile number will consume credits as normal. We can forward a received message from a specific number to one of your Contact Groups. This is great if you wish to send a quick message to a group of people when on the move. 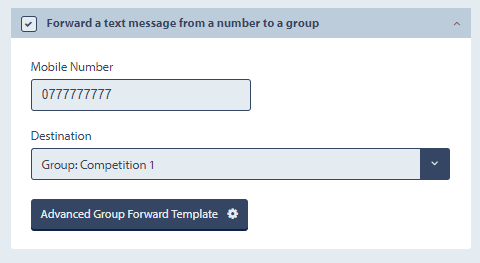 To do this, navigate to Forward a text message from a number to a group on the right-hand side. Enter the mobile number you want to use and then select the Destination you want the message to be sent to. We will then send a message on to a specific group if your inbox receives a text message from this specific number. An Advanced Group Forward Template exists so that you can configure exactly how you want your message to look with the addition of custom fields. Once you have configured your settings, click Save Settings. Let’s say you’re leading a school trip and you need to notify parents that you’re running late on the way home. You don’t have access to your Textlocal account so you may be thinking how am I going to let the parents know? There is an easy way to contact all the parents without having to individually message each parent. You can set up Forward a text message from a number to a group to trigger when you send a text message from an authorised mobile number. This will then trigger the inbox to send your ‘school trip delay’ message to your ‘Parents’ contact group. Because you can have multiple response or forwarding functions active at once, together, these settings can be incredibly powerful. Get in touch with the team for more information on how to set up and configure your SMS inbox to your businesses needs.